"I am torn about what to order, so I'd love if you would choose for me. *Then I list the options out*. But don't tell me, I trust your judgement and I can't wait to be surprised!" For some I know this is a little odd and others can't imagine not knowing what they are going to eat, however I'm all about a good surprise. There is another reason that I take this sort of approach: decision fatigue. 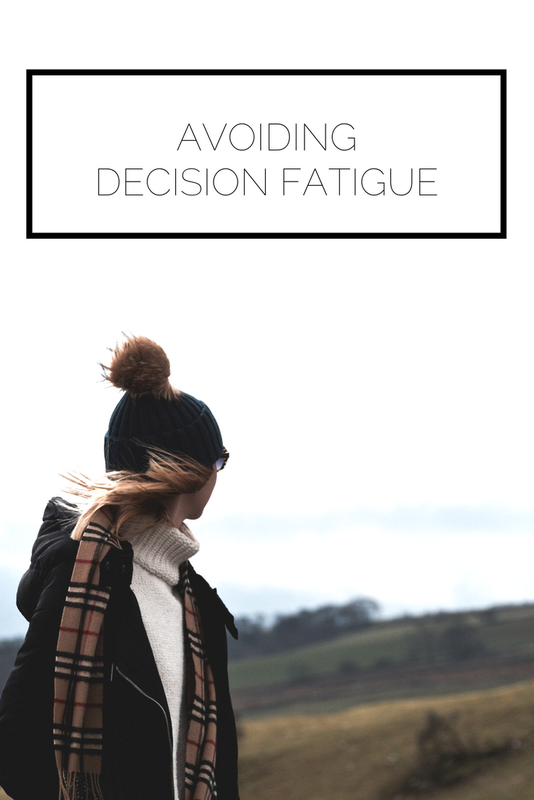 According to Wikipedia (my favorite source for reliable information...or at least semi-reliable information you can get with minimal effort), decision fatigue is the deteriorating quality of decisions made by an individual after a long session of decision making. It is now understood as one of the causes of irrational trade-offs in decision making. Every single day we make countless decisions: what are we going to wear, what music are we going to listen to, what app are we going to open first, what projects are we going to prioritize, who are we going to text for lunch? The list simply goes on and on. Often, this leads to a feeling of overwhelm or a diminishing desire to do anything that will require more decisions. When this happens, you become less effective and less productive, and who wants that?!?! The question then becomes how can you avoid decision fatigue? Minimize the amount of decisions you have to make on a daily basis. You know how Steve Jobs always wore the same outfit, or how Warren Buffet follows a simple diet? These successful people save their mental energy to dedicate to work that has a great return. Why spend what collectively turns into hours figuring out what you're going to do next when you can institute a schedule and keep a calendar that prioritizes what you need to accomplish, instead turning your brain power to the activities that actually matter? This is not to say that you have to be completely regimented and live your life by a color-coded calendar (not that I know anyone who does that...), but rather that reducing the amount of decisions you are faced with can improve your performance. As I discussed in my last post about avoiding anything that suggests quick fixes (i.e. "Follow these 3 steps to make your life unbelievably happy and fun forever"), I am not going to do my usual numbered process. However, I am going to give you some actionable advice that you can incorporate into your life as you work on your decision making skills - because what good is a post telling you to minimize something but not actually giving you information on how to do it? When you are aware of the role decision fatigue plays in your life and you take steps such as these, you can begin to allocate your time to your highest value activities. This will take concentrated effort, but the benefits are worthwhile! Have you experienced decision fatigue? What are some of the ways you combat this pest?